Deviled Egg Recipe makes easy deviled eggs the old fashioned way with mayonnaise, vinegar, pickles and pimentos. In the old days cooks made delicious sweet Bread and Butter Pickles to go in their egg salads. 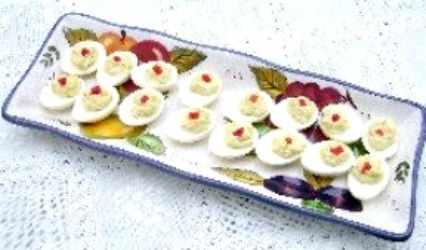 At church dinner or family reunion there would be several plates of deviled eggs, each one a little different. I thought folks brought them because they were easy to make. But it was because they were so delicious and disappeared fast. This is Mama's old recipe made easy. Customized it to your taste by adding additional ingredients suggested below. Place eggs in a large saucepan. Add water and salt. Bring to a boil and cook 15 minutes. Remove from heat. Drain. Pour on cool tap water to make eggs cool enough to handle. Remove egg shells immediately and rinse eggs to remove any shell fragments. Set eggs aside to cool while you start preparing the filling. Slice cooled eggs in half, lengthwise or crosswise. Remove yolks and place into mixing bowl. Add other ingredients and mix until smooth and all lumps are gone. Stuff each egg white with filling until all is used up. If desired, top (garnish) with one of your favorite ingredients listed below. You can stir one or more of the above ingredients into the filling mixture instead of putting it on top of the eggs. Serve on a platter with no embellishments or on a bed of lettuce or spinach leaves. Make it your own recipe, adding the extra ingredients you like! I recently made this next recipe when I was trying to use up leftover Lime Tarter Sauce. It was delicious! Slice eggs in half lengthwise or crosswise. Remove yolks and place in a small mixing bowl. Mix in enough Lime Tarter Sauce to make it as moist as you prefer. Spoon into egg cavities. Top with chopped onions or chives. Eggs are a healthy choice. They are a valuable source of Iron, Protein, B-Vitamins, and Vitamin D, which is not in a lot of foods. Purchase the best quality eggs you can, either grade AA or grade A. Check the expiration date on the carton and use them before that date. Take them home immediately, and refrigerate in the original container at 45F or below. If an egg is fresh when you place it in a pan of water, it will lie on the bottom. If it sort of wants to move around a bit, or one end pop up, it is getting stale. If it rises to the top and stays there, it is NOT fresh. It should not be eaten. Egg shells are porous and lose moisture, therefore they become lighter as they age.